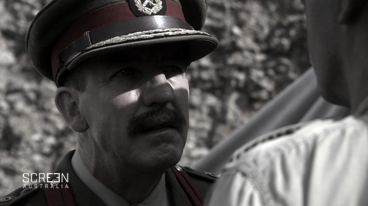 Video clip synopsis – The terrible defeat suffered by the Australian and New Zealand forces under British command at Gallipoli changed General John Monash's attitude to how to fight the Great War. Monash at Gallipoli is an excerpt from the documentary Monash – The Forgotten Anzac, produced in 2008. Monash – The Forgotten Anzac One of the most brilliant generals of World War I and an architect of Anzac Day, Sir John Monash helped create the Anzac legend by ensuring the courage of his men was enshrined in Australian history. Today he is all but forgotten. Monash – The Forgotten Anzac explores the character and achievements of an extraordinary figure in Australian history, the battles he fought both on and off the battlefield, and the prejudice he overcame to help win a war. Monash – The Forgotten Anzac is a Screen Australia Making History Production in association with 360 Degree Films. Produced with the assistance of Film Victoria. Developed and produced in association with the Australian Broadcasting Corporation. Special Thanks to the Australian War Memorial and the National Film and Sound Archive (of Australia). Sir John Monash (1865-1931) commanded troops during some of World War One’s most famous battles. He gained a reputation as a great military planner and strategist, which led to battlefield victories in France and Belgium and a knighthood. These successes, however, were preceded by the terrible defeat suffered by the Australian and New Zealand forces under British command at Gallipoli, Turkey, now commemorated on Anzac Day. Monash was a most unlikely Digger hero. Of Prussian-Jewish extraction, cultured, fussy, an organised, methodical disciplinarian to the point of obsessive, he was a middle-aged, overweight citizen-soldier with no active war experience when hostilities broke out in 1914. Yet he was the leader Australian soldiers needed both during and after the war. At Gallipoli he found out the hard way – in battle – that this wasn’t a war in which to be overweight. He was so overweight he could not fit through some of the trench tunnels. With the withdrawal from the Turkish peninsula, Monash and most of the Australian forces were sent to the western front in France. They thought after Gallipoli the fields of France would be a picnic. They were wrong. The reality of industrialised warfare became apparent; mile upon mile of trenches, barbed wire, mud and extraordinarily heavy artillery. Through many trials and errors, the Australian Divisions were starting to become the hardened, intelligent fighting force which would prove so effective by 1918, when Monash and the AIF (Australian Imperial Forces) played a crucial role in defeating Germany on the western front. After the war, when Monash and the AIF returned home to relative neglect, Monash strived to ensure soldiers received due honour, recognition and assistance. As part of his campaign he played a pivotal role in creating Anzac Day commemorations. Without Monash, this annual commemoration would most likely have faded into obscurity. Work with a group of two or three students to investigate, respond to and discuss the questions and points that follow. World War 1 is referred to in this clip as the Great War. It is known also as the ‘war to end all wars’. Find out why these phrases were used to describe World War 1. * What are conditions like in the trenches? * What forms of combat do you see? * What examples do you see of the technology of war available at this time? What does the clip indicate led to the Gallipoli disaster? Explain how Monash’s personal account and archival footage helps to persuade viewers that accurate information is being conveyed. Listen carefully to Monash’s personal account. Which particular words give important information about the Gallipoli landing. Are they factual, descriptive or emotive words? What does this account tell you about Monash? Why do you think the filmmakers decided to include this part of Monash’s personal account? The clip concludes with a re-enactment showing Monash confronting Charles Bean, Australia’s official war correspondent. Why is Monash upset? What does he want from Bean? Does his request seem reasonable? Why or why not? Investigate war-time reporting of Charles Bean in Australian and British newspapers. What do you discover that is not evident in this clip? The documentary uses several sources of information to help convince viewers that Monash and events are accurately portrayed. Is re-enactment the best way to provide this information? How does it compare with other sources of information in this clip, such as comments by a historian or the use of archival footage.